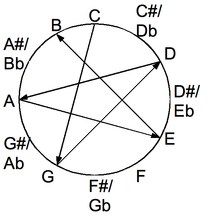 The consecutive open-notes of all-fifths tuning are each spaced seven semitones apart on the chromatic circle. 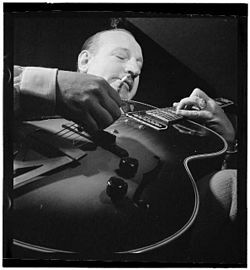 Carl Kress played jazz with all-fifths tuning. In the standard guitar-tuning, one major-third interval is interjected amid four perfect-fourth intervals. In each regular tuning, all string successions have the same interval; all-fifths tuning has perfect fifths between all string successions. which have intervals of 3 octaves minus a half-step between the lowest and highest string. The conventional tuning has an interval of 2 octaves between lowest and highest string. All-fifths tuning has been approximated with tunings that avoid the high b' replacing it with a g' in the New Standard Tuning of King Crimson's Robert Fripp, which has been taught in Guitar Craft courses. Guitar Craft, which has been succeeded by Guitar Circle, has taught Fripp's tuning to 3,000 students. The consecutive open notes of all-fourths tuning are spaced apart by five semitones, reversing the ordering of all-fifths tuning (with seven semitones). 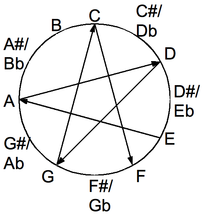 All-fifths tuning is closely related to all-fourths tuning. All-fifths tuning is based on the perfect fifth (the interval with seven semitones), and all-fourths tuning is based on the perfect fourth (five semitones). The perfect-fifth and perfect-fourth intervals are inversions of one another, and the chords of all-fourth and all-fifths are paired as inverted chords. Consequently, chord charts for all-fourths tunings may be used for left-handed all-fifths tuning. ^ Sethares (2001, "The mandoguitar tuning" 62–63): Sethares, Bill (2001). "Regular tunings". Alternate tuning guide (pdf). Madison, Wisconsin: University of Wisconsin; Department of Electrical Engineering. pp. 52–67. 2010 Alternate tuning guide, including a revised chapter on regular tunings. Retrieved 19 May 2012. ^ Zwerdling, Daniel (5 September 1998). "California Guitar Trio". All Things Considered (NPR Weekend ed.). Washington DC: National Public Radio. Retrieved 25 March 2012. .
^ Fripp (2011, p. 3): Fripp, Robert (2011). Pozzo, Horacio, ed. Seven Guitar Craft themes: Definitive scores for guitar ensemble. "Original transcriptions by Curt Golden", "Layout scores and tablatures: Ariel Rzezak and Theo Morresi" (First limited ed.). Partitas Music. ISMN 979-0-9016791-7-7. DGM Sku partitas001. Denyer, Ralph (1992). "Playing the guitar: Alternative tunings". The guitar handbook. Special contributors Isaac Guillory and Alastair M. Crawford (Fully revised and updated ed.). London and Sydney: Pan Books. pp. 158–159. ISBN 0-330-32750-X.